Jan 21, 2017- Like other earthquake-stricken families in Dadagaun of Sitapaila-5, Nagarjun Municipality, SB Tamang’s (name changed) extended family looks ideally fit to apply for just a single housing reconstruction grant worth Rs 300,000—an amount pledged by the government for each affected household. Tamang, his four sons, their spouses and children were living under one roof until the house was reduced to rubble by the devastating earthquake of April 25, 2015. But when time came to register with the government to claim the housing grant and relief package, the Tamangs identified themselves as five separate families and applied accordingly. The concerned authority swiftly issued an identification card in the name of Tamang’s four sons, acknowledging five members of the same family as separate beneficiaries of the promised aid. Since then, SB and his four sons have already received Rs 25,000 each under two different relief packages distributed by the government and look set to receive the first tranche of the housing grant worth Rs 50,000, the distribution of which is underway. Talking to the Post, the Tamang family maintained that they were living separately and using different kitchens, despite living in the same house. “We were living separately in one house. It is the reason we applied separately for the grant. Since we have already spent more than Rs 600,000 to build makeshift shelters, we are thinking of paying back the moneylender with what we receive from the government,” said SB Tamang, referring to how the 12-member family has split into four makeshift shelters following the quake. Like SB Tamang, B Giri’s (name changed) family of Irkhu Village Development Committee in Sindhupalchowk was ideally fit to receive a single package of earthquake reconstruction grants. The family had lost just one home in the disaster. But as time came to apply for the grant, Giri, and his eighty-year-old mother, who was under his care, registered themselves as two separate families. The mother-son duo too faced no obstacles enlisting themselves on the beneficiary roster. “My mother was living separately in the barn. She started living with me after it sustained cracks during the earthquake. We are now using it just as a cow shed,” said Giri. In November, Giri and his mother received the first tranche of Rs 50,000—-one for the house that was lost during the earthquake and another for the barn that sustained some damage during the earthquake but continues to house the family’s cow and goats. Despite the Nepal Reconstruction Authority (NRA)—the government mechanism overseeing the reconstruction efforts nationwide—clearly warning against such maneuvering, stories like that of the Tamang and Giri families are becoming increasingly common as the process of distributing reconstruction grants begins to pick up pace. Multiple factors, including the weak presence of the NRA and of government bodies at the ground level, a big say of cross-party local mechanisms in identifying earthquake victims and the lack of strong verification and monitoring mechanisms, have encouraged extended families to split into multiple units to rope in added monetary benefit. Widespread malpractice and the lack of oversight have also, in turn, encouraged even those whose houses were not affected by the quakes to claim government grants. In months that followed the 7.8-Richter Gorkha Earthquake, the Ministry of Home Affairs had carried out a Preliminary Damage Assessment survey to tabulate the extent of destruction caused by temblor and its many aftershocks. The survey found that a total of 500,717 houses were fully destroyed and another 269,190 houses were partially damaged during the earthquakes. 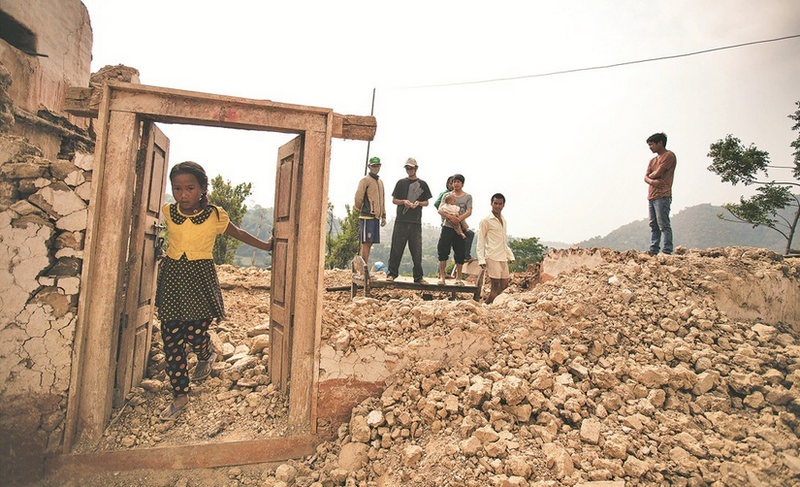 Of them, a total of 66,636 houses were destroyed in Sindhupalchowk, one of the worst-hit districts. Taking this into consideration, local stakeholders, including officials at the District Administration Office, were initially expecting to receive a similar number of applications for the housing grant. At the most, authorities believed that the total applicants would not exceed 70,000. The National Population Census conducted in 2011, after all, had registered 66,688 households in the district. But once the applications started pouring in, the number of affected households had shot up by more than 17 percent than what the preliminary assessment report had indicated. Till date, more than 78,000 households have already received the first tranche of the housing grant in the district and an additional 18,000 have filed fresh applications to be enlisted as beneficiaries claiming that they were left out of the list the first time. Like Sindhupalchowk other districts too have recorded a dramatic increase in the number of the affected households. In Dolakha, a district bordering Sindhupalchowk, there were 45,688 households in 2011, according to the last census. But 51,762 affected households have already received the first installment of the grant in the district till date, while an additional 21,712 families have filed an application seeking aid claiming they were overlooked during the registration process. The same pattern could be spotted elsewhere in other districts identified as worst-hit by the quakes. In 11 districts where the NRA has nearly finished distributing the first installment of grants, there were a higher number of recipients than what was shown by the Preliminary Assessment Survey. 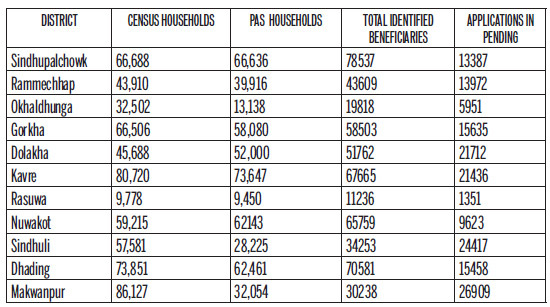 The number of identified beneficiary households has gone well and above the number of total households registered in the 2011 census in Sindhupalchowk, Dolakha, Rasuwa, and Nuwakot. And while it may be too early to ascertain an exact number of beneficiaries of the housing grant, as the verification process is still underway in Kathmandu, Bhaktapur, and Lalitpur, NRA officials’ estimate the final number of the recipients could reach as high as 700,000. More than 94 percent, from a total of 531,961 earthquake affected households identified so far in 11 districts, have already received the first installment of the grant, while an additional 160,000 families have filed applications seeking to get onto the roster. The number will go up even further, up to 30 percent, if the NRA decides to enlist the pending applications. In other words, the government may end up spending as much as Rs 250 billion, more than two thirds of the total estimated budget for reconstruction, on private homes alone. The government had expected to complete the reconstruction project with a budget of Rs 669.50 billion, although recent NRA estimates indicate that the cost could go up by at least 25 percent. “There is a danger that the large scale irregularities, if not checked in time, might lead to a full blown crisis. There is a need for strong, proactive intervention if we are to prevent a failure of the reconstruction project,” said a NRA official, who requested anonymity. Because of the discrepancies seen in the registry of the affected and of the handing out of housing grants, disgruntlings are already beginning to brew on the ground. Locals are increasingly angry with the government for providing money to ‘fake’ victims while leaving out those who were genuinely affected. And with the irregularities coming into the limelight, stakeholders have already started shifting the blame onto each other. NRA officials have been pointing to local administrations, local administrations are passing the blame onto NRA units on the ground, and the local NRA units are blaming cadres of political parties and local parties, on their part, are passing the blame down to the people. During a field visit, the Post found that an interplay of multiple factors have provided a fertile ground for the irregularities in the quake-hit districts. There is a growing sense of insecurity among affected families, especially the poorest, who are not in a position to manage the funds required to rebuild their houses on their own. And because the aid pledged by the government is not sufficient to build a home, malpractices have become commonplace. “It would cost at least Rs 5 lakhs—excluding cost of labour—to build a home, as per the earthquake resilient design approved by the government. I still don’t know how to arrange extra money that would be required to build the house,” said Tej Bahadur Giri, 55, an earthquake victim in Irkhu, Sindhupalchowk. Like most others in the village, Giri has not yet started building his home which was destroyed by the 2015 earthquake. “The government should either increase the amount or let us build homes the way we like. We would have started building our homes long ago had the government not tied our hands with criteria that are hard to meet without increasing the grant amount. It’s beyond our capacity to build the exact design prescribed by the government,” said Giri. 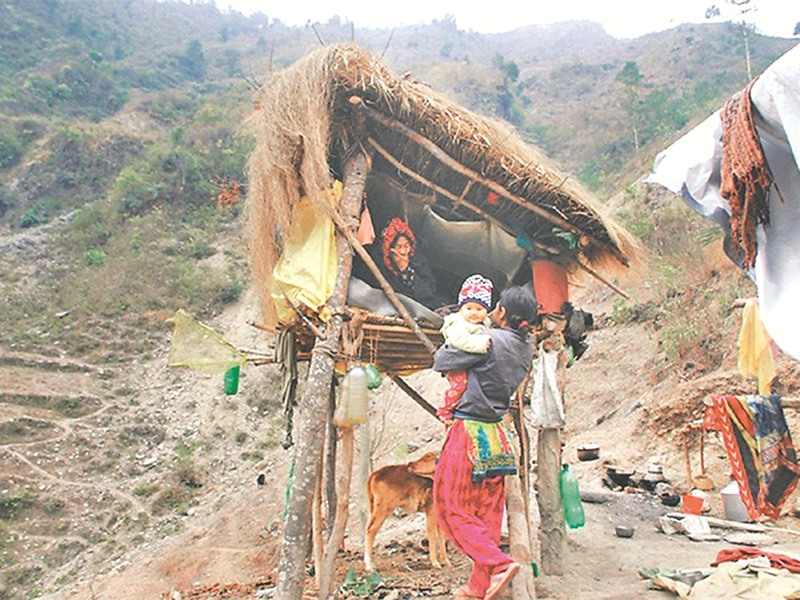 Not just the affected families, the Post found an equally alarming number of families unaffected by the earthquake registering themselves for government aid in Kathamandu Valley and many villages in Sindhupalchowk and Dhading that it visited for reporting. “More than 80 families have received grants in our village though nothing happened to their houses. But genuine victims were removed from the list of beneficiaries. We lodged a complaint at the VDC office, asking the administration to punish fraud and provide grant to real victims. The district administration had assured us that it will probe into the matter but nothing has happen yet,” said Binod Shah, a local of Jogimara village of Dhading district. There are around 1500 household in Jogimara. “Someone who had long migrated from our village, nearly two decades ago, is on the list of beneficiaries, listing a long abandoned home. In fact, three members of that same family have been enlisted showing a house, a cottage and a barn separately,” he said. Shah leads a struggle committee formed by 450 families ‘genuinely affected by the earthquake’ but excluded from the beneficiary list. Recently, the committee even padlocked the Village Development Committee Office demanding action against culprits and justice for genuine victims. According to Shah, at least 350 households in the struggle committee are illegible for the full reconstruction grant. The situation is similar in neighbouring villages, including Dhusa, where several victims are campaigning for justice for genuine victims and are demanding punishment for fraud. “People with connections easily registered themselves with the NRA although their house sustained just minor cracks. But the poor were left behind even though they lost their houses. It’s a common problem across the district,” said Chandra Silwal of Dhusa VDC, Dhading. how ‘fake’ victims managed to find a place in the list of beneficiaries, as Nepal is literally functioning without local administrations. The country has not held local-level elections since 1999. In absence of elected local representatives accountable to the people, local administrations have been in control of a nexus of local cross-party politicians. This cross-party mechanism of local bodies has a decisive say on all local matters. And the NRA is increasingly dependent on them to carry out all activities, including vetting the list of earthquake victims. But instead of assisting the NRA in distinguishing ‘fake’ victims, the mechanism is increasingly becoming an instrument to misuse the state coffer to appease party cadres and loyalists. The legal ambiguities have not helped either. The existing laws state that one destroyed household may constitute more than one family but doesn’t specify the limit. There are no clear laws to define what makes a single household eligible for multiple grants. The laws also fail to explain what makes a family eligible to be included in the list of beneficiaries. The Post found that many families were enlisted as beneficiaries of the full grant amount although their house sustained only minor cracks. Ambiguities like these have encouraged many to resort to wrongdoing with little fear of repercussion and the lack oversight from the government is another important factor encouraging the anomalies on the ground. The Ministry of Home Affairs did issue a circular last year directing district administrations to take action against ‘fake’ victims following reports of increasing complaints against rampant irregularities in the distribution of the first two packages of immediate relief—Rs 10,000 and Rs 15,000 respectively. The NRA’s local chapters have received more than 10,000 complaints against ‘fake’ earthquake victims. Around 8,000 complaints were received in Nuwakot district alone. Only a 1,000; however, have returned the amount they were handed by the government, according to local administrations of the 14 most affected districts. NRA officials said that they are bringing a new set of laws in place to discourage disingenuous earthquake victims as the existing laws are unclear and are incapable of combating such a large-scale fraud. The proposed laws endow the local administration with the authority to charge ‘fake’ victims with fraud as per provision enlisted in the civil code. It also envisions stringent action against the concerned staffers who were accrediting their applications and distributing the grant. “We are aware about such irregularities but our main focus right now is to complete the reconstruction as it’s already very late. Those not building houses despite receiving grants will be punished,” said Govinda Pokharel, the CEO of the National Reconstruction Authority. Pokharel, however, said that the NRA is sensitive about not leaving out genuine earthquake-affected families. “Last week, the NRA had cleared 70,000 complaints. Many new families have been enlisted in the beneficiaries’ list. We will look into other complaints gradually,” said Pokharel. NRA has added 18,000 families in the final list from 11 districts. Pokharel, who recently replaced Govinda Gynwali as the CEO of the NRA with promises to do better than his predecessor, faces manifold challenges in the successful completion of the multi-billion reconstruction project. The biggest challenge, however, will be curbing the misuse of funds, all the while, ensuring that genuine victims are not left out.